Guardians Rising had its first weekend of tournament legality this weekend. From the early tournament results with the set, it looks like the most hyped deck, Garbodor/Tapu Lele GX, which gained attention after having some success in Japan, has managed to live up to the hype, at least for now. In this article, I will be going over my list for the biggest hype deck to come from Guardians Rising, and that is Garbodor/Tapu Lele GX/Tauros GX. 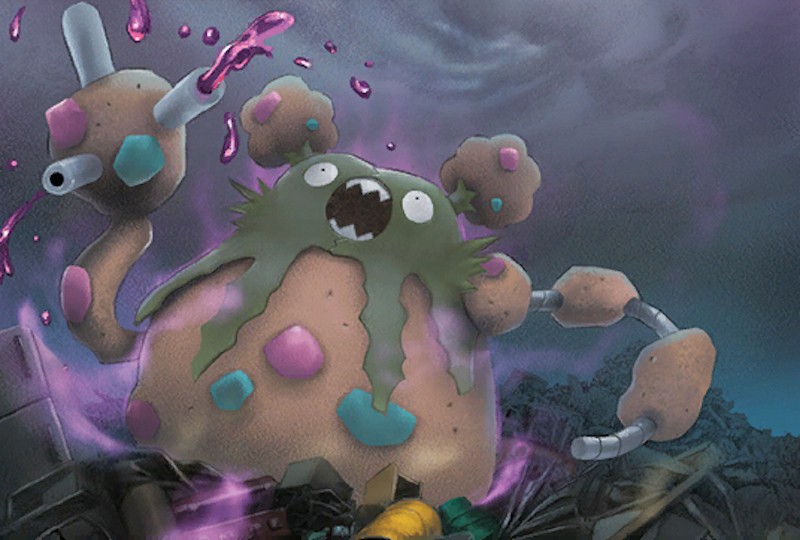 The deck is most notable for its inclusion of Garbodor GRI, whose Trashalanche attack is a massive disruption to the Item heavy format that preceded the release of Guardians Rising. Trashalanche does 20 damage times the amount of Item cards in the opponent’s discard pile and it only costs a single Psychic Energy to use. Against anyone trying to use Item heavy setup engines, Garbodor easily carries the win, with the exception of decks like Gyarados, which can prize trade with a one prize attacker. I think the overarching Garbodor deck archetype is super interesting and it will be interesting to see how the format plays out. In the tournament results from this past weekend I’ve seen the Tauros GX variant in some areas, the more recently hyped Drampa GX variant do well in other areas, and even variants with Trevenant GRI doing well (and that tested awful for me). All three are actually fairly different decks from each other, so I would imagine there are some significant matchup differences that aren’t immediately apparent that alter which meta games which of these decks is able to do well in. Another interesting note about Garbodor decks is how different lists are from one another. In some of the past few formats lists all kind of reached a very similar logical end point among different deckbuilders because the Trainers’ Mail/Ultra Ball/Shaymin EX/VS Seeker engine was so simple and cookie cutter that it fit into everything and it was almost always the best way to build any archetype. Now with Garbodor coming into punish players for that engine, the best way to build decks around a Tapu Lele GX engine isn’t immediately apparent and players are putting forth lots of different ideas for how they think these decks are best built. For purposes of this article, I am writing about the Tauros GX variant of Garbodor, which I have found to be the strongest variant from the games I’ve played with the decks so far. I do include Drampa GX in my list, but it is another option in the toolbox and not something I pro-actively try to setup with Team Magma Base like some of the dedicated Drampa GX lists do. 4 Garbodor GRI – Garbodor is the primary threat in the deck, so it’s good to play a 4-4 line of it to make sure that there are seldom situations where you want a Garbodor, but can’t find one. It’s a unique Pokemon to build a deck around as it isn’t the most threatening Pokemon by itself, building strength off of your opponent playing Items, but it is the key to the deck giving it the ability to swing for massive amounts of damage for a single Energy attachment. While Trashalanche is the attack we’re primarily playing Garbodor for, don’t sleep on Acid Spray. 70 damage from Acid Spray can be turned into 2HKO’s with the aide of Choice Band and Professor Kukui. It also can discard an Energy if you flip heads, making it a disruptive 2HKO attack. 4 Trubbish BKP – I think that Trubbish BKP is the optimal Trubbish to play in the deck. Being able to discard Energy off of the opponent’s Pokemon can be impactful towards forcing your opponent to have to play more cards to find Energy. With Choice Band, it hitting for 10 damage is also significant as you can use Acid Spray for 40 damage against GX and EX Pokemon, which can setup knockouts later in the game. Trubbish GRI can theoretically put pressure on the opponent by discarding Items cards, but this actually isn’t’ that impactful. Some decks engines simply can’t setup without Items, so you don’t need to give an extra push against decks with such engines. Against other decks with more Supporter based engines (like the mirror), your probability for actually hitting an Item card off the discard is lower than flipping heads on Acid Spray, so you probably waste an early game attack for an insignificant effect and then that Trubbish gets knocked out if you’re using Trubbish GRI. 3 Tapu Lele GX – This is the engine through which the deck is able to run, being able to search out the tech supporters, like Brigette and Ninja Boy, through use of its Wonder Tag Ability. It also serves as a formidable attacker with Energy Drive being able to 2HKO most Pokemon with Energy attached to themselves. 2 Tauros GX – As Trashalanche is a reactive attack, you need something that will put pressure on your opponent, and Tauros GX is able to do just that with its Horn Attack being able to get 2HKO’s now with Choice Band, as well as being mostly good for taking out smaller pre-evolution Pokemon. The threat of its Mad Bull GX attack can make it awkward for your opponent trying to deal with it, while also trying not to play Item cards. With Ninja Boy, the threat of Mad Bull GX exists for the opponent when trying to damage any of our Basic Pokemon. 1 Drampa GX – Drampa gives the deck a big hitter among its Big Basic Pokemon. After anything in the deck is injured, Drampa GX can use its Beserk attack for 150, which is 180 with Choice Band, which is notably good for knocking out most Pokemon in the game, with the exception of evolution GX’s and some select Basic EX and GX Pokemon. Its Righteous Edge attack hasn’t been overly impactful in my testing, but it can be used to punish sloppy play on behalf of the opponent, and there could be some decks that do come along that aren’t being played yet that really struggle with having their Energy removed. 1 Tapu Koko SM30 – This is going to be a smart inclusion for the deck with the improved strength of Gyarados after the release of Guardians Rising, where it got Rescue Stretcher and Choice Band to boost its power level. Flying Flip does 20 damage and can knockout the benched Magikarp to help create an advantage for you in the matchup. If they have a Mr. Mime in play, you would have to use it in conjunction with a Hex Maniac. Flying Flip is also strong against everything except Rough Seas or other types of healing decks. For just a single Double Colorless attachment you can do 20 spread to everything, which can be boosted to 50 damage to the Active with a Choice Band. At 110 HP, it’s somewhat difficult to knock out in one hit, so it can typically get a few attacks off making for a very soft field. Conversely, instead of setting up knockouts, it can also finish off some knockouts of stuff you just fell short of taking a knockout against. It also has free retreat, which is a nice add on for an already strong card. This works nicely with Drampa GX, allowing Tapu Koko to take a hit, and then be able to retreat to the bench to sit there to power up Drampa GX for when it wants to go Beserk in the game. The Tapu Koko promo is available in both the Tapu Koko figure collection and the Tapu Koko pin collection (as SM31), and is legal for tournament play starting June 2nd, 2017. If you are going to Seattle Regional Championships, which Tapu Koko won’t be legal for, and want a counter to Gyarados, then you can play either Spinda PRC or Azelf XY142. The deck includes 4 Professor Sycamore, 4 N, and 3 Lysandre. These are staple Supporters that are found in every deck, which don’t warrant much discussion. Additionally, the deck plays 4 Ultra Ball as it’s the best search card in the game, and as you want to use Tapu Lele GX’s Wonder Tag Ability, and also search out both Basic and Evolution Pokemon, there isn’t a substitute ball card that works better for this deck. Now, onto the more interesting stuff. 3 Professor Kukui – Professor Kukui helps smooth out some of the damage math that the deck needs, giving the deck +20 reach with its attack which can make all the difference for taking a knockout versus not taking one. A common scenario that comes up in the mirror match, for example, is Tauros GX only doing 60 damage with Horn attack, but Trubbish BKP having 70 HP, so Professor Kukui can help you get that extra damage that you need for the knockout. There are also lots of points in games where you don’t really need to draw anything with the deck, so you can afford to just sit back and grow your hand by two cards to gain a few more options while also doing more damage with your attacks. 1 Lillie – This is to give the deck another draw out for late game N’s outside of Professor Sycamore. Depending on your opening hand, turn 1 Lillie can also sometimes be the optimal Supporter to use, letting you get that 8 card draw to start the game. I originally had this of a 2-of, but found I wasn’t using it enough to warrant multiple copies, so I swapped one out for the third Professor Kukui. 1 Brigette – The Tapu Lele GX for Brigette combo is one of my favorite tactics to come out of Guardians Rising. This is my preferred turn 1 Supporter for this deck. I am using this combo in a variety of different evolution decks, and I think being able to fill their bench right away with pre-evolutions is exactly what Evolution decks needed to start becoming more competitively viable. In most games I go for 3 Trubbish to make sure I can evolve into any of my Garbodor as soon as I draw into them. Depending on your hand and the matchup you may want to get Tauros GX (when you don’t already start one), or even Drampa GX is a good option to target as the 3rd Pokemon if you can get a turn 1 attachment down onto it to make it a DCE away from being able to attack with its Beserk attack. Some people are playing Fan Club in this deck slot, but playing a nerfed version of a bench filling Supporter, just to have an out to Tapu Lele GX’s Wonder Tag, doesn’t seem worth it. If I don’t have a follow up Supporter available for the next turn, then I would grab a Professor Sycamore or Lillie to start the game, as in most situations I would be using a Wonder Tag to find Brigette anyhow, so I would just grab the other Supporter instead. The situation of starting Brigette and then also not having another Supporter out is going to come up so infrequently that it’s not worth playing a lesser Supporter card to play around it. 1 Hex Maniac – This provides a lot of utility in a wide range of matchups. Against Decidueye GX/Vileplume it can buy you a turn to attach Choice Band and use Ultra Ball to search out any Pokemon you need, as well as stop their Feather Arrow damage for a turn. Against Sylveon GX you can use it on the first turn of the game to shutoff their Energy Evolution, threatening for an easy turn 2 win if they can’t find another Basic Pokemon. Against decks like Greninja BREAK and Volcanion EX it can shutoff their Abilities for a turn, which can be advantageous when used in the right spots. It also can be clutch for shutting off opposing Tapu Lele GX or Shaymin EX’s at the right time. I should note that I wasn’t taking Greninja too seriously headed into the format, and I think it will see a sharp decline in play as the format goes on, but for now Greninja is seeing some serious play again, so it warrants grinding out a bunch of games against Greninja if you’re going to play this deck in a tournament and make adjustments to the Hex Maniac count, or putting in Giratina promo or Garbotoxin Garbodor depending on what tests best out of these options against it. 2 Ninja Boy – This helps us get into our preferred early game attackers, and also allows us to maximize the effectiveness of Tauros GX’s Mad Bull attack. There are four different Big Basic attackers that you can Ninja Boy in and out of depending on the situation, and I have have even found myself using Ninja Boy to turn something into a Trubbish so I can then evolve it into Garbodor every now and then. 1 Field Blower – Gives us Tool Removal, which can be very strong not only for being disruptive of our opponent’s strategy, but also for getting +40 damage in the discard pile for Trashalanche. 1 Super Rod – I prefer Super Rod for this deck for its versatility in also being able to get Energy back. If you’re not too worried about Energy, Rescue Stretcher is fairly effective as well, giving you the added option of being able to get a Pokemon directly into your hand. I’m not sure if there is a right answer between the two and think it mostly will come down to player preference. 3 Choice Band – A large part of the meta game is EX or GX Pokemon, so Choice Band is able to give you greater punching power against these decks. It lets you get to OHKO numbers earlier with Trashalanche, lets Drampa GX hit for 180 with Beserk, and can let Tauros GX hit for 90 with Horn Attack, which is good for 2HKO’s against a lot of Basic Pokemon EX/GX. 1 Fighting Fury Belt – I still like having one of these in the deck. It can be impactful with Tauros GX in particular, letting it hit for 70 damage against one prize attackers with Horn Attack in the early game. Additionally, in the late game, after you’ve danced around your opponent’s Field Blowers, you can play it down at a point in the game where it can’t be removed which can swing a game in your favor. Lots of stuff is building around being able to hit for 180-190, but they can’t reach all the way up to 220. Even when your opponent does have Field Blower available, if they don’t draw into it at the right time, Fighting Fury Belt can still serve its purpose. 2 Float Stone – These are in here to give the deck some Item/Tool based Switching effects to let you get into your preferred attacker in the early game. I think Float Stone is better than Switch or Escape Rope in the context of this format as it stays on the Pokemon, so they’re forced to play a Field Blower if they want to get it into the discard pile, which can be important against other Garbodor decks. 2 Altar of the Moone – This gives the deck some additional non-Item based Switching options. This gives us additional outs for mobility against other Garbodor decks as well as against Item lock decks, such as Decidueye GX/Vileplume AOR. This gives you a good option for getting your damaged Pokemon with Choice Band attached to the bench so you can take advantage of the damage boost on Drampa GX’s Beserk attack. Garbodor BKP – I’ve seen a lot of lists playing this as a 1-of. It’s fairly solid in the deck, as you can more fearlessly use stuff like Choice Band as your Tool to power Garbotoxin as you can use Altar of the Moone to get it back to the bench if your opponent tries to Lysandre stall it. I don’t think Garbotoxin is that strong of an Ability right now as most Ability based decks are playing 2 Field Blower, but it can be effective if activated in the right spots. If your meta game has a lot of Greninja BREAK decks in it, then playing a single Garbodor could be okay to try to mess them up a little bit, but even then I think I’d rather make some adjustments to fit in more Hex Maniac and continue being able to roll 4 Trashalanche deep. I am also highly skeptical of Greninja BREAK being a viable threat as we approach the International Championship and think it will likely be weeded out of the meta game significantly as we work through the upcoming Regional Championships. VS Seeker – This card wouldn’t be bad in here, but in the context of the current meta game, I feel like forgoing VS Seeker is the right move for this deck. Decidueye GX/Vileplume doesn’t appear to be going anywhere, so having more actual Supporter cards is better in that matchup, and this also gives us a small way to gain an advantage over opposing Garbodor decks. In the right meta game, cutting some of the tech Supporters like Professor Kukui and Ninja Boy down to a 1-of can be used to fit in VS Seeker if you’re in a meta game where you won’t be punished for playing it. Team Magma’s Secret Base – Some players have been playing this to put damage counters on their benched Pokemon to be pro-active in boosting their Drampa GX’s Beserk attack. Honestly, I consider the Drampa GX/Magma Base deck to be a completely different deck from this one, but as some people equate the two decks as being the same archetype it’s worth mentioning. Ultimately I think the effectiveness of this strategy comes down to whether you play Max Elixir or not. If you play Max Elixir, you are able to build a completely different deck that is built around a fast Drampa GX to put immense pressure on the opponent early. This deck is more Item heavy and is part of the problem that Trashalanche was designed to stop. Delinquent – This sees some play in the deck as it can force your opponent to discard Item Cards boosting Trashalanche’s damage (and sometimes also outright getting rid of their hand), but I think it’s too too hit or miss to warrant a deck spot. Wobbuffet PHF – In meta games with high amounts of Decidueye GX/Vileplume this can be worth finding a deck slot for, as it can give you a way to shutoff Irriating Pollen letting you be able to play Items again. This isn’t too important for my list for the deck though as it is already a very Item light deck. However, even with being very light on Items, Wobbuffet could still be useful for slowing down a Decidueye GX/Vileplume AOR’s setup by preventing them from being able to use Shaymin EX’s Setup. With Psychic Energy, you can also attack with Wobbuffet, although it’s generally outclassed by Trashalanche in most game situations. Shaymin EX – I don’t see any reason that Shaymin EX needs to be played in this deck as you have Tapu Lele GX already as a consistency out off of Ultra Ball, and you already can use most of your attacks for a single Energy attachment meaning you don’t need tons of draw power for this deck. More so, I’ve found Shaymin EX to be a massive liability. With Choice Band in the format it’s become super easy for most decks to knock it out, so playing Shaymin EX in a slower deck generally just punishes you more than it helps you. I’ve cut Shaymin EX completely in favor of Tapu Lele GX in the majority of my non-speed decks. There are three GX attacks in the deck. Something to keep in mind when playing the deck is that there are three GX attacks in the deck. Mad Bull GX is going to be the most common GX attack that is used with the deck as it provides the deck a quick and easy OHKO option. However, situations will arise where the other two GX attacks in the deck are able to be used. Tapu Lele GX’s Tapu Cure GX attack lets you heal two of your benched Pokemon. This is in particular great when you’re using a your Basic Pokemon to attack and they get loaded up on damage, your Drampa GX in particular. If you time a Tapu Cure GX at the right time, you can heal off your Drampa GX, take a hit on the Tapu Lele GX, and then retreat back into Drampa GX and swing for a maximized Beserk attack. Drampa GX’s Big Wheel GX attack, which lets you shuffle your hand into your deck and draw 10 cards, isn’t the GX attack you want to use, but it’s important to remember it’s there as an emergency option if you really need to use it. There are lots and lots of attacks. Every attack that I play the Energy to use I have used at least once when playing the deck. That’s 12 different attacks that the deck can use, and they can all be modified in their damage output with Choice Band, Professor Kukui, and for some Fighting Fury Belt. That’s a lot of different attack/damage combinations that players have at their disposal. With so many different options, I think this is a deck that will over the longterm greatly reward those that take the time to master it if it is able to establish itself as a longterm presence in the meta. The variety of attack options, as well as the nature of a deck that is mostly built upon highly variable multi-hit knockouts, lend this deck to being one that will present players with plenty of opportunities to misplay themselves into tougher spots. Garbodor/Tapu Lele GX is a highly disruptive deck archetype that will help move the meta game away from the turbo Trainers’ Mail/Ultra Ball/Shaymin EX engine that has dominated the game since Roaring Skies. If players choose to go into tournaments with those engines they are going to be punished by players building around Garbodor. I wouldn’t say that Garbodor has completely pushed all of these decks out of the meta game, as it certainly hasn’t and won’t, but it has altered the meta game significantly and pushed the game in a different direction. Interestingly enough, Garbodor has pushed the game more towards the cards released in the Sun and Moon sets. With less incentive to rush through one’s deck on the first turn of the game, players may turn back to playing some of these slower setup decks built around high HP GX Pokemon, such as Alolan Ninetales GX…which brings us the reason why we can’t completely say goodbye to the old decks. Decks such as Volcanion EX, Turbo Darkrai EX, M Rayquaza EX, and some more can be very strong against some of these slower setup decks. Volcanion EX in particular is something I could see being played to deal with some of the slower setup decks in the format, although if the slower setup decks people are playing are all Water based, such as Greninja BREAK and Alolan Ninetales GX, like we saw during the first weekend of Guardians Rising‘s legality, then there may not be a great spot for Volcanion EX in the meta. Greninja being able to OHKO a Volcanion EX with Moonlight Slash because of Choice Band significantly improves what was often a matchup where Greninja was outsped. In addition to these, there are a few decks that should be able to stick around with turbo engines because of their nature. Decidueye GX/Vileplume AOR can get away with it because it has Vileplume’s Item Lock to fall back on to disrupt other decks. A lot of the Garbodor/Tapu Lele GX lists that are seeing play so far are still fairly Item heavy, with many playing Trainers’ Mail and VS Seeker themselves still, so that can be punished by Vileplume’s Item Lock. The other big deck that is a major threat with the old engine is Gyarados AOR, which becomes a lot more powerful with Choice Band. Now, even if it prizes a Magikarp, it can get up to some impressive damage numbers because of Choice Band. Because of this, I’m not exactly sure what I should think of the deck. My initial impression would be that I think good players at large tournaments would figure out how to play around it, so while it may have a solid showing as far as Day 2 goes, when it comes to Top 8 and winning tournaments it might get shutout. However, then exists the possibility that players stop playing the deck because of it, and then players try to exploit that by going more towards turbo decks again, which could open new paths for it to win a major tournament. However, I may also be underselling the deck’s potential quite a bit. Tauros GX, Tapu Lele GX, Drampa GX, and Tapu Koko are all very impressive Basic attackers, so it is possible that this backbone for the deck is good enough to win major events consistently. I really don’t know what to expect from the deck at the Regional level and higher, but I do think the deck is going to be amazing during Summer League Cups. The skill gap between the best players at a League Cup and the general field can be fairly large, so if good players play this deck at League Cups it’s possible that opponents aren’t equipped with the skill needed to properly navigate the matchup against Garbodor, so I could see players misplaying themselves into losses against Garbodor decks being a common sight at the local level. Overall, I think Garbodor decks as a whole are very strong, and I expect them to be a major threat at the local level and a significant threat towards winning at the Regional level. When testing this deck I have issues finding energy sometime. Is Steven a worthy inclusion here so I can have access to energy almost any time in the game? I would put in more Energy cards before I would start playing Steven.